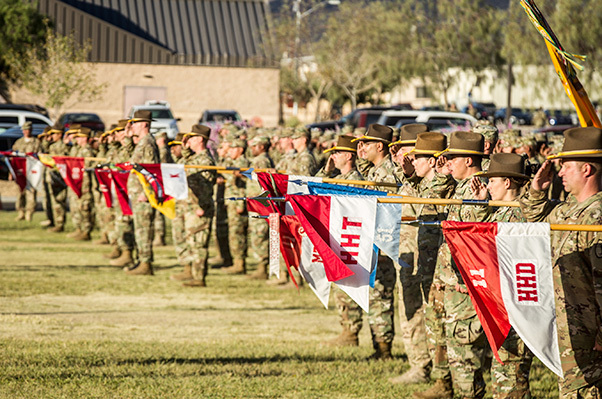 Troop leaders and guidon bearers from the 11th Armored Cavalry Regiment salute the national colors during the 11th ACR’s Change of Responsibility ceremony at Fort Irwin’s Fritz Field, Sept. 20, 2016. U.S. Army Command Sgt. Maj. James T. Gandy, relinquished responsibility of the Blackhorse Regiment to Command Sgt. 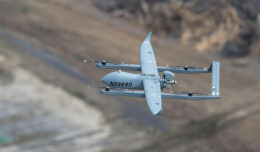 Maj. Michael J. Stunkard, during the ceremony. Col. Joseph D. Clark, commander, awards Command Sgt. 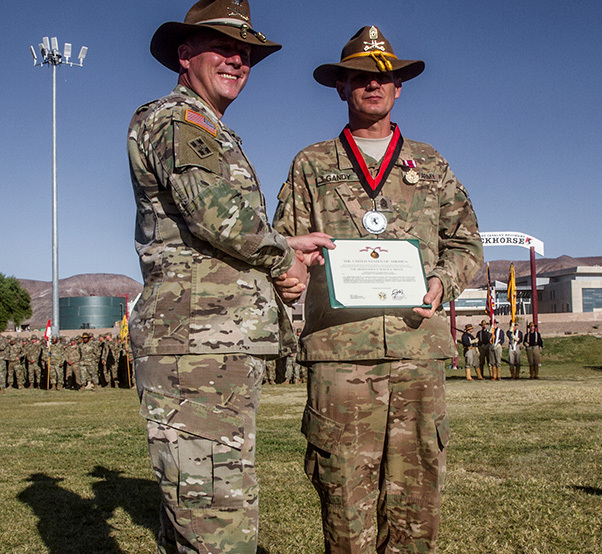 Maj. James T. Gandy, 11th Armored Cavalry Regiment, the Meritorious Service Medal for his service to the Blackhorse Regiment at Fort Irwin’s Fritz Field, Sept. 20, 2016. 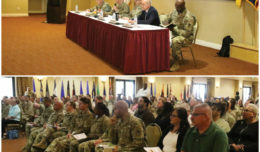 Gandy’s award citation highlighted his dedication, commitment, selfless service, and extraordinary performance during his tenure with the 11th ACR. U.S. Army Command Sgt. 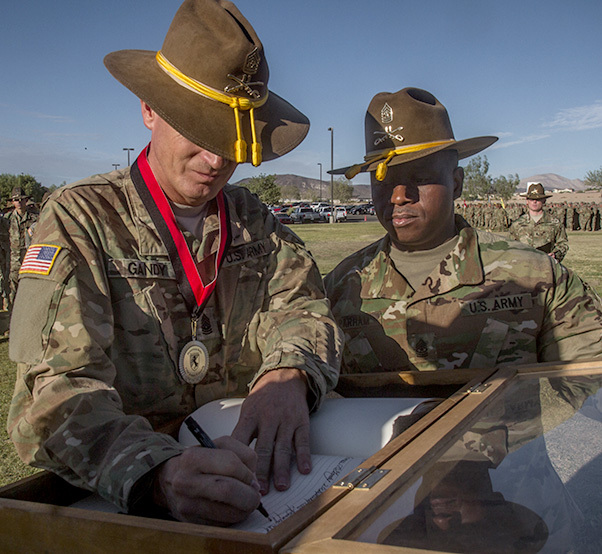 Maj. James T. Gandy, signs his name into the Blackhorse Honorary Rolls as Sgt. Maj. Reginald Parham looks on, prior to the 11th Armored Cavalry Regiment’s Change of Responsibility ceremony at Fort Irwin’s Fritz Field, Sept. 20, 2016. 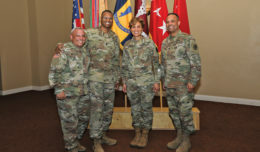 U.S. Army Col. Joseph D. Clark (left), commander, 11th Armored Cavalry Regiment, knights Command Sgt. 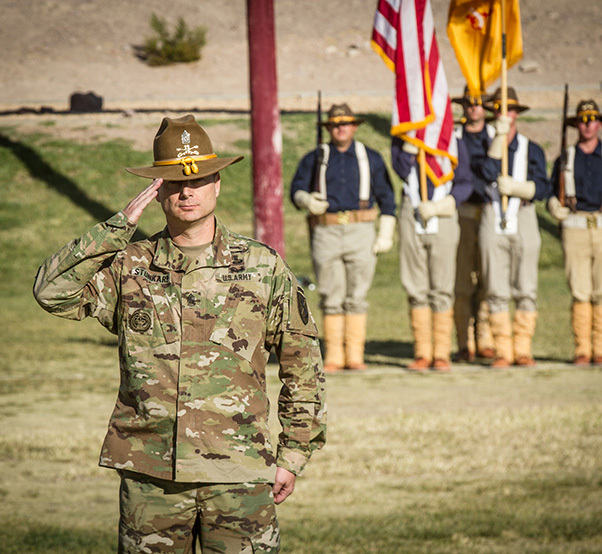 Maj. James T. Gandy, 11th ACR, during his induction into the Blackhorse Honorary Rolls prior to the regiment’s Change of Responsibility ceremony at Fort Irwin’s Fritz Field, Sept. 20, 2016. U.S. Army Command Sgt. 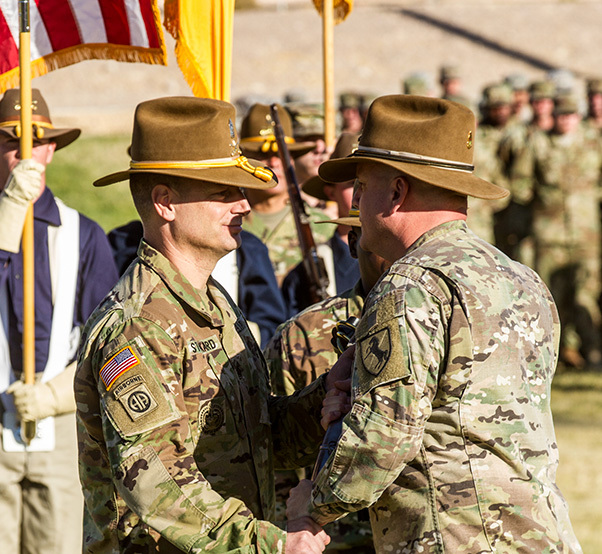 Maj. Michael J. Stunkard, 11th Armored Cavalry Regiment, takes charge of the Blackhorse formation for the first time at the conclusion of the 11th ACR Change of Responsibility ceremony at Fort Irwin’s Fritz Field, Sept. 20, 2016. As the senior Non-Commissioned Officer in the regiment, Stunkard bears the mantle of perpetuating the customs, traditions, and the rich history of the Blackhorse regiment. 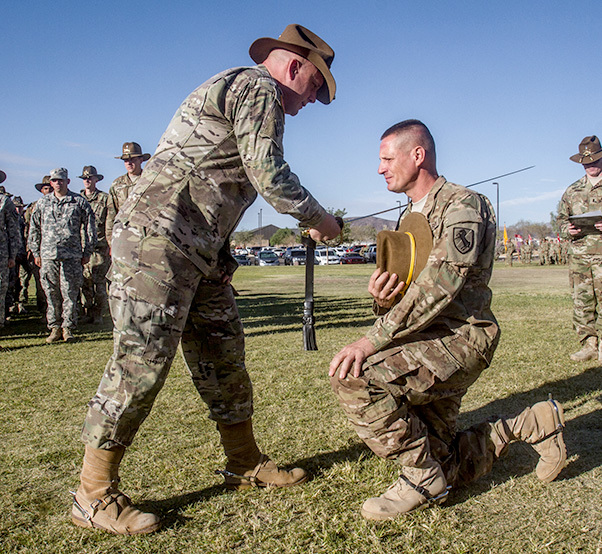 U.S. Army Col. Joseph D. Clark (right), commander, 11th Armored Cavalry Regiment, passes the saber to Command. Sgt. Maj. Michael J. Stunkard, senior enlisted advisor, 11th ACR during the Change of Responsibility ceremony on Fort Irwin’s Fritz Field, Sept. 20, 2016. The passing of the saber represents the transition of responsibility and authority from one leader, to the next.